← Church tradition and scripture: which has the authority? When looking back at the first century church, we get surprised by how much it was different from the churches of our century, including all denominations. In all the current churches we see at least two hierarchies: laymen and clergy. Some how the clergy in all denominations are kind of mediators between laymen and God. They are the religious experts who know better that the rest. It gets even more complex when we observe traditional churches like catholic and orthodox ones.The hierarchies are many and the mediation is a practiced fact in daily religious life. 1- How close the members to each other? 2- How far Jesus Christ (the blue figure with Xi Rho sign) is from the rest of the church members? 3- How unique each member is (different colors represent different functions and roles)? Hint: he first century church was one body of many organs: apostles, prophets, miracle workers, healers, teachers of faith, pastors, helpers, evangelists, administrators, and various kinds of tongues. (1 Cor 12: 28, Eph 4: 11). The current church consists of mainly two kinds: religious authorities with big tongues and their followers of laymen with big ears. 4- Who is in the middle between Jesus and the rest? 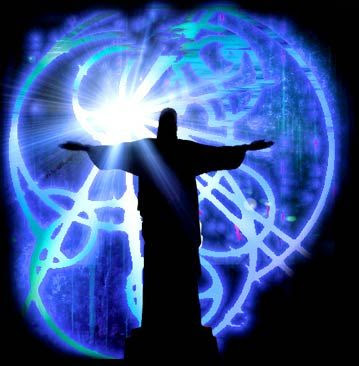 5- How clear and sharp Jesus (blue figure) presence is? 6- Do you see a difference between a living organism and an organization? 7- How we can get back our life in Christ as one church? Church of the first century as drawn by The Holy Spirit through the pens of the apostles in the Bible. 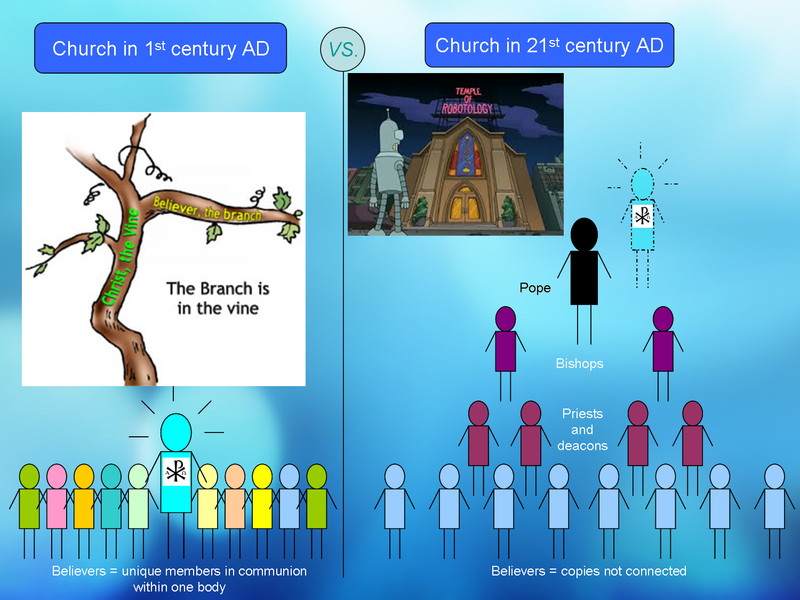 It is a church whose members are one body and one Vine. It is a church where Christ is theirs, in their midst and the head of them (without any mediation except Himself). It is a church where the Holy Spirit is the commander who fills them and governs the Church. It is a church where the relationship between the members is organic. It is a church where the greatest is of most service, the slave of others. It is a church where members are equal in dignity, but different in spiritual gifts. The Church of the 21st century, after centuries of development, adopted the world system of the Roman State and built classes and hierarchies of powers. It is a church where people became the lowest status and their salvation is controlled by the clergy of upper classes. It is a church where Christ gradually disappeared from daily life as the Good Shepherd to dwell in seventh heaven. It is a church where Christ can not be accessed except through the mediation of the clergy or the intercessions of the saints. It is a church where papal authority is supreme, and Pope’s titles and status are even higher than that of Christ Himself. It is a church where Popes wear official clothes like kings: crown and scepter, and sits on the papal throne, his hands are kissed while alive, and his dead body is touched whith reverence after death. This entry was posted in bible, Christianity, Church, Jesus, Theology and tagged Apologetics, bible, Christianity, church, Church Fathers Writings, Jesus, Theology. Bookmark the permalink.